Monastery of the Martyrs Mar Behnam and Marth Sarah (Syriac: ܕܝܪܐ ܕܡܪܝ ܒܗܢܡ ܘܡܪܬ ܣܪܐ‎, Arabic: دير مار بهنام‎, Mar Behnam Monastery), was a Syriac Catholic monastery in northern Iraq in the village Khidr Ilyas close to the town of Beth Khdeda. The tomb of Mar Benham was heavily damaged on March 19, 2015 by the Islamic State, and the exterior murals were desecrated in all of the monastery's buildings. Repair work restoring the monastery and the tomb of Mar Behnam to its pre-ISIS condition was completed by early December 2018. The monastery was built in the 4th century by a king named Senchareb as penance for martyring his son Mar Behnam and daughter Sarah after they converted to Christianity. after its establishment, the monastery was part of the Church of the East up until the 14th century as evidenced by Mongolic inscriptions left by Mongolian Christian pilgrims in the 1200s, and contributed greatly to the Christian world under the care of the Syriac Orthodox Church. Inscriptions on Sculptures in the church showed that renovations were done in 1164 and between 1250-1261. Records show that the monastery suffered greatly during the period from 1743-1790 due to attacks carried out by Nader Shah and later Persian muslim, against the Christians in the region. The monks of the monastery established contact with Rome in the late 18th century as a form of protection against Nader Khan, which led to the gradual conversion of the inhabitants of Bakhdida to the Syriac Catholic Church. In 1790 the monastery was taken over by the Catholic Church and was managed for eight years until the Syriac Orthodox church took it back. For some unknown reason, the monks abandoned the monastery in 1819, likely due to the loss of their flock in that region. The monastery changed hands again to the Syriac Catholic Church and was repopulated in 1839, and has been so into the present time with the exception of a three-year abandonment as a result of the 2014 ISIS invasions. The monastery was the residence of and is the resting place of a number of Syriac Orthodox Patriarchs. The monastery was renovated in 1986, and was visited by thousands of Christians and Muslims yearly until ISIS took control of the area. During the 2014 Northern Iraq offensive, jihadist troops of Islamic State of Iraq and the Levant took control of the monastery. The troops removed crosses from the monastery, threatened monks with execution and then expelled the monks with nothing but the clothes on their backs. On March 19, 2015 Islamic State released photos showing the blowing up of the historic tomb of Saint Behnam. After more than 2 years of occupation, the monastery and its surrounding area was liberated by Iraqi Security Forces on November 20, 2016. ^ Jones, Christopher (June 23, 2015). "Another Treasure Lost in Iraq: The Story of Mar Behnam Monastery". Hyperallergic. Retrieved October 24, 2016. 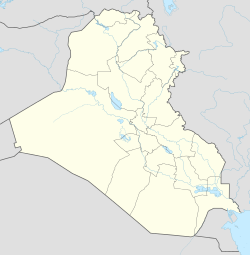 ^ "ISIS destroy 4th Century Christian monastery in Iraq". ^ Girgio Bernadelli (June 11, 2014). "The new plight of Christians in Mosul". Vatican Insider. La Stampa. Retrieved June 24, 2014. ^ Vivian Salama; Cara Anna (March 6, 2015). "Outrage: Extremists take ancient statues, damage Iraqi site". San Francisco Chronicle. Retrieved March 6, 2015. ^ Hawramy, Fazel (July 24, 2014). "Iraqi Christians in Mosul told by Isis to convert to Islam or be executed". The Guardian. Retrieved July 24, 2014. ^ Mezzofiore, Gianluca (March 19, 2015). "Isis 'blows up famed 4th-century Mar Behnam Catholic monastery' in Iraq". ^ "Iraqi security forces have retaken Monastery of the Martyrs Mar Behnam and Marth Sarah southeast Mosul - News from war on ISIS in English from Iraq, Syria - Deir ez-Zur operation, Raqqa operation - isis.liveuamap.com". News from war on ISIS in English from Iraq, Syria - Deir ez-Zur operation, Raqqa operation - isis.liveuamap.com. This page was last edited on 19 February 2019, at 06:35 (UTC).